Give Sonny Taylor a minute to say something, and an afternoon will pass by before he comes up for air. Yesterday, the 71-year-old African-American placing judge, who is a friend to just about everyone, came down from the track’s upper echelons to mingle with the minions on the Turf Terrace. Among the luncheon munchers, Taylor told endless tales about old Hialeah, how he timed Spectacular Bid’s Woodward Stakes walkover in 1980 and how the great Panamanian Eddie Belmonte once brought his pet baby lion into the jockey’s room. The next morning, Eoin Harty, the 45-year-old Irish-born trainer of many of Darley’s horses including Street Cry, E Dubai and Ruler’s Court, stood ready to take people on a tour of the old Greentree property – to wit, the “Whitney Estate.” After several years of Stonerside ownership, the historic tract on the backside of the backside of the racetrack is now owned by Harty’s client Sheikh Mohammed, and the place looks like the “after” in a “Curb Appeal” segment. Improvements are everywhere, from the new rip-rap stone entrances to the paddocks, training oval, golf course, tennis courts, buildings and slate-roofed 8000 square foot, seven-bedroom, seven-bathroom main house. 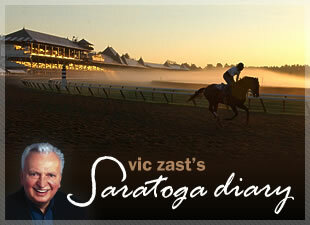 One of the magical qualities of Saratoga is that you come by history even when you’re not looking for it. For example, a celebration of the track’s past is scheduled as a replacement for graded stakes competition this Saturday. With no major stakes on tap, management is betting that the public will get turned on by vintage costumes, special food offerings and throwback prices on concessions by way of its “Tradition Turns 140” promotion. Speaking of history, when Saratoga used to run only four weeks in August, the feature race on each successive Saturday was one of exceptional significance - the Whitney, Alabama, Travers and Hopeful. To acquiesce to racing’s new reality – an era of frail horses and Breeders’ Cup emphasis - NYRA, this weekend, will stage the Waya (Friday), four overnight stakes (Saturday), and the Yaddo and West Point (Sunday) instead. The best race on today’s card was the A.P. Smithwick Memorial Steeplechase, and it was won by High Action, an 8-year-old gelding. But the best action seen today was a basketball game at the Senior High School between a traveling team of sixth graders from Texas and the jockeys. Co-coached by trainer Todd Pletcher and University of Kentucky coach Billy Gillispie, the losing jockeys’ squad was led by “Pistol Kent” Desormeaux, Eibar “Mr. Twister” Coa and Rudy “Don’t Give Up the Day Job” Rodriguez. The donations from the game’s sponsors went to the Permanently Disabled Jockeys Fund. After all was said and done, generosity remained Saratoga’s overarching tradition.